Make your next move the smart one! D & G Poly Products the King of insulated shelters! Welcome to D & G Polyethylene Products Ltd, manufacturer of all weather polyethylene insulated and non-insulated shelters and enclosures. At D & G Poly Products we are proud to manufacture both seamless-moulded and modular style polyethylene buildings and enclosures that are used in a wide variety of settings from wellhead and valve enclosures in the oil and gas industry to vehicle and livestock shelters. D & G shelters are for any setting in which corrosive elements, and harsh Canadian climates are present. Our fire-retardant urethane spray foam insulation offers an R-10, R-12 composite construction, great for freeze protection. We also offer a variety of containment units; drip trays, skid tray, containment sumps and chemical pump containments. With today’s tough economic challenges facing oil & gas producers, every dollar saved is a dollar earned! Proudly Canadian and for nearly 30 years D & G Poly Products has earned the reputation of manufacturing quality products at exceptional prices. With one of the largest bi-axial rotational moulding ovens in Western Canada, D & G Poly Products has the capacity to mould exceptionally large seamless products. We offer a wide variety of insulated and non-insulated polyethylene shelters that are lightweight, corrosion resistant and maintenance free. With an extensive selection of shelters, the uses are unlimited. Our lightweight seamless-moulded Poly Shelters can be purchased in a variety of set sizes ranging from our “Rook shelter”- a 7’3” conical to our “King shelter” measuring 9’ x 9’ x 9’. 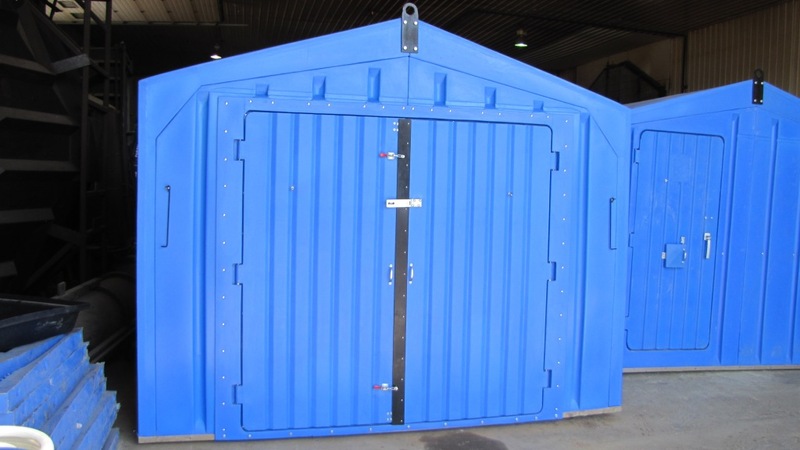 Our modular shelters with built in truss systems, which can be customizable to suit your needs, range in widths of 10’, 12’6” and 16’; while our lengths are determined in 4’ increments to a measurement of your requirement. Accessories including explosion proof CATA-Dyne heaters can also be included to customize the building to your specific needs and requirements. D & G shelters can be delivered to your location completely assembled and ready to be put into action - "Set it and forget it!" With our nearly 15,000 sq ft facility, we are proud to offer in-house Autocad product design, mould fabrication and production services. Our 125,000 lb capacity silos and automated material handling system allows us to pass the savings of purchasing our raw materials in bulk, along to our valued customers. We take pride in assuring our clients of a superior quality control of products, friendly service as well as affordable and prompt delivery services. We are constantly upgrading our equipment to serve our clientele better. At D & G Poly, our management team has over 50 years combined experience in rotational moulding and product design and along with our staff, we are eager and willing to work with you to develop a building that specifically accommodates your needs. “Business is like chess, so make your next move the smart one” - with D & G insulated shelters. The main product line of our well established company focuses on polyethylene shelters and buildings which can be utilized for storage, and freeze protection for water injection wells, gas wells, and headers. We take pride in assuring clients of a superior quality control of products, friendly service, as well as affordable, and prompt delivery services. With our 125,000 lb capacity silos and automated material handling system in place, D & G Polyethylene Products Ltd. is able to pass the savings of purchasing our raw materials in bulk, along to our valued customers. Since 1990 D & G Shelters have earned a reputation of being virtually indestructible. As with all products manufactured by D & G, only high quality virgin polyethylene is used. 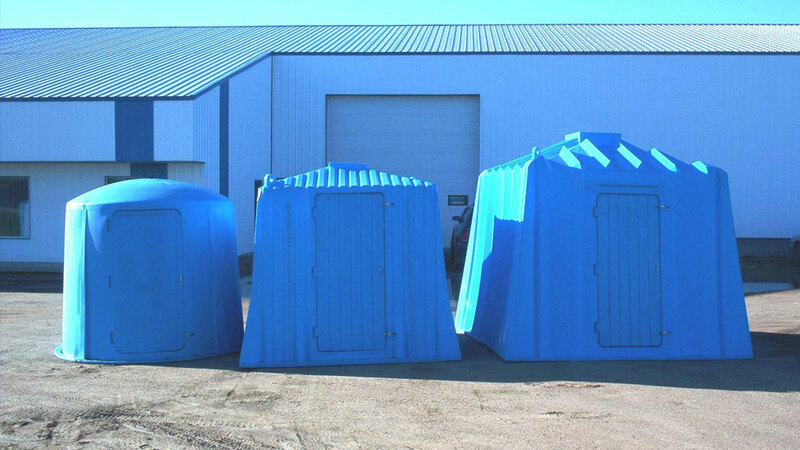 Our lightweight, durable polyethylene shelters are maintenance free and will provide years of service with no rotting, rusting, painting or shingling which is ideal for our harsh Canadian weather conditions. Critical reinforcements such as trusses and hinges are molded directly into our shelters. 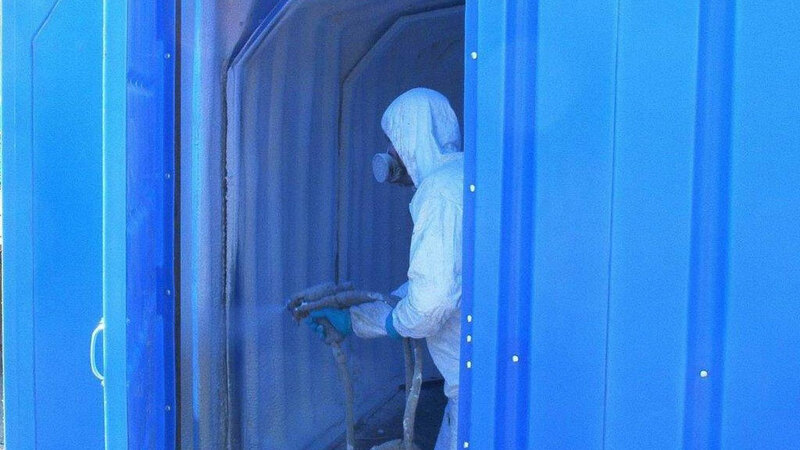 D & G Shelters are perfect for many applications such as water injection shelters, header buildings, gas well shelters, skid units, and storage sheds. These shelters can be ordered in a variety of sizes ranging from a 7’3” conical style to a spacious 16’ x 48’ modular building. They have an excellent longevity, are lightweight and totally portable. The standard features include; polyurethane foam insulation, lift lugs, and a walk-in door. A wide variety of optional features include catalytic heaters, venting, plexi-glass windows, gas detector inspection doors and hinged roof hatches for wire line servicing.